Only 10 ingredients and 25 minutes minutes are needed for this delicious BLT pasta salad with a super creamy and spicy avocado dressing to bring it all together! Bacon is my weakness. It’s one of the few foods I crave, but when I want it I need to have it. Sweets never tempt me; I can be seated at the dessert table without taking a bite, but a good crispy slice of thick cut bacon I can never say no to. And that’s where Wright® Brand Naturally Smoked Hickory Bacon comes in. Their bacon is thick cut for that perfect bacon experience, as well as hand-selected, hand-trimmed and 100% wood smoked over hickory chips for eight hours. Now that’s my kind of bacon. I must get my love for bacon from my dad – who is also a die-hard bacon fan. This is one of our father-daughter shared bonding experiences — our morning bacon with our eggs. But who says bacon has to be for breakfast? Luckily, it happens to do well all day long. So if you’ve got a dad like mine who loves his bacon, what better way to treat him on Father’s Day than with this BLT Pasta Salad . This BLT pasta salad comes together in under 30 minutes, with only a few key ingredients required for the main dish, as well as a few for the best creamy spicy avocado dressing ever. And yes, if you ask me, avocados must always be served with bacon. Those two go hand in hand. The other key ingredients in this BLT pasta salad are cherry tomatoes, baby arugula, and penne pasta. Spiral pasta would work well here too, but stay away from any long noodles – they just won’t soak up the flavors correctly in this BLT pasta salad. The most important part of this recipe is to get that bacon cooked perfectly. You want it crispy to the max without being burnt or blackened at all. This is a serious skill. I’ve gone through many rounds of burnt bacon when I wasn’t paying attention, or had the burner turned up too high because I was too impatient to wait. The key is to keep the heat on medium – don’t turn it up to high, let that Wright Brand Naturally Smoked Hickory Bacon crisp up slowly and evenly. You can see the crispness just jumping out at you from the pic below. Now those are perfectly cooked slices of bacon right there. For the dressing, combine all ingredients in the food processor or blender until smooth and then bring everything together in a large bowl. Make sure to cut the bacon into big pieces – you don’t want to mince or dice it, the flavors will get lost in the salad. You want a solid piece of bacon with every bite. This BLT pasta salad can be enjoyed hot or cold and makes for the perfect treat for a bacon-loving dad. I know my dad loves this recipe and yours will too! Serve for lunch or dinner for an easy 30 minute family meal. This would also be perfect for a summer picnic, barbecue or 4th of July celebration. 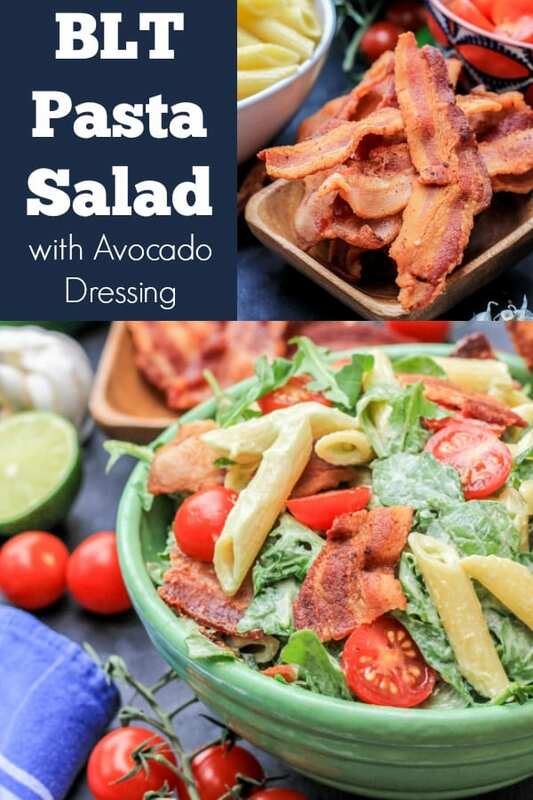 Celebrate Father’s Day this year by making this BLT Pasta Salad with Wright Brand Naturally Smoked Hickory Bacon and my creamy avocado dressing. You can find Wright Brand Naturally Smoked Hickory Bacon at Walmart and be sure to check out this Ibotta offer to save $1.50. In a blender or food processor combine dressing ingredients and blend until smooth. Add salt and pepper to taste. In a large bowl combine, pasta, arugula, cherry tomatoes, bacon and dressing. wuuuut!!!! This pasta salad sounds super delicious!!! Omg I have to try it! I literally love all the ingredients! and love the sound of the creamy avocado dressing! Thanks! All my favorites too! Oh heck yes! This is basically the past salad of my dreams! Love it!!!! Never go wrong wth bacon! You had me at creamy but spicy! The avocado dressing sounds absolutely amazing. I must try it. Let me know what you think when you do!